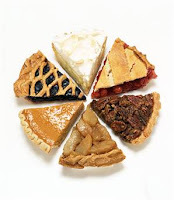 Critical Thinking Blog: All Opinions Are Not Equal: A Bigger Pie or Equal Pieces? I think the first choice. It strikes me as an idealistic form of capitalism. The second choice sounds strangely like, "Should we work toward communism?" alright, you saw through my wording. But, i didn't want to use words that cause people to cling to the platform they're most comfortable siding with. I wanted to back it up to a higher-level concept and see what made more sense to people. Sorry 'bout that. :) Still I say the first choice because theoretically the harder people worked, the more they would benefit economically. Thus everyone would "reap what they sowed" so to speak. In the second choice, the folks who had the wealth "redistributed" away from them would get a bit perturbed and would stop working so hard, because why work hard when it's not benefiting them anyway? The folks who had the wealth "redistributed" to them wouldn't bother to start working hard, because hey, they get it anyway, so why work hard? The economy would spiral downward into collapse. Can I choose a little from the first and a little from the second (this is why I'm no fun in pure capitalism vs. pure socialism debates). I've said it before and I'll say it again, both work in theory but I don't believe either works in practice. It is all about getting the correct mix. steve, the idea isn't that creating the bigger pie would create a better world. It's the idea that if the government's job is to solely create the bigger pie, then it can be the job of the family, the community and faith-based organizations to increase the size of the pieces.